Signed, sealed, delivered: Yoshinori Muto. NEWCASTLE UNITED HAVE announced the signing of Japan international Yoshinori Muto from Bundesliga side Mainz. Muto comes to St James’ Park on an initial four-year contract after he was granted a work permit at a hearing today, the Premier League club have confirmed. The striker becomes the fifth players to link up with the Magpies ahead of their 2018/19 campaign in the English top flight. “I am very happy to be a player for Newcastle United,” the 25-time capped Japan international told Newcastle’s official website. “I am really looking forward to playing in front of the fans. 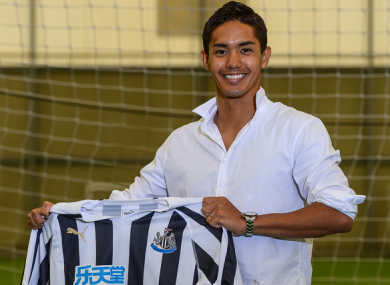 Manager Rafa Benítez added: “I am really pleased to have Yoshinori Muto with us. We were following him for quite a while. Muto moved to Maiz from his hometown club FC Tokyo in 2015, and he appeared once for his country at the recent World Cup in Russia. Email “Newcastle United complete signing of Japanese striker Muto from Mainz”. Feedback on “Newcastle United complete signing of Japanese striker Muto from Mainz”.